If Boston is the band that has created the Adult Oriented Rock sound, the Rockman is the device that enabled creating the guitar sound of the eighties. From Sports by Huye Lewis - as soon as 1983 - to Satriani's Surfin' with the Alien via ZZ Top (Eliminator, Recycler, etc...) and Don Henley's "Building the perfect beast", the Rockman sound was omnipresent throughout the whole decade.This black box was a real revolution. Considered now as the ancester of the modern digital multieffects, the Rockman was much more than a portable practice amp. It was, more than anything else, the first amp simulator ever made available as a commercial product. The first SR&D product, the Power Soak, was a honourable success. Its nature (a professional tool) was not suitable for a wide distribution to the end-consumers. 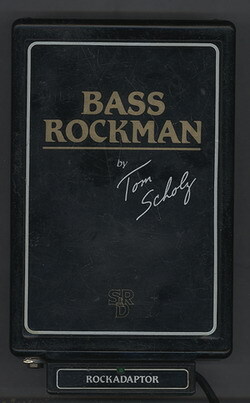 The Rockman was launched in 1982: it was an instant hit. In 1982, there was no homestudios, no DAW's, and playing DI through the band mixer was too exotic for a majority of guitarists. So the Rockman was completed by a fancy accessory: headphones! The name itself, Rockman, was based on Sony's Walkman ®, and a set of headphones was actually the most convenient way to provide quality stereo sound.